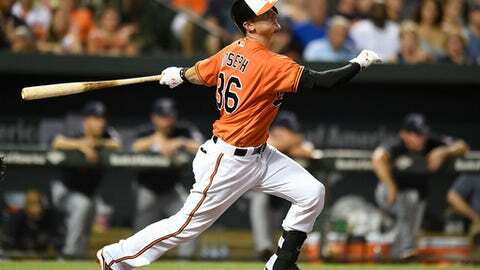 ST. PETERSBURG, Fla. (AP) The Baltimore Orioles won their ninth straight salary arbitration decision over more than two decades, defeating catcher Caleb Joseph. Joseph, who set major league records for most at-bats and plate appearances in a season with no RBIs, was awarded the team’s $700,000 offer rather than his $1 million request in a decision Thursday by arbitrators Mark Burstein, Steven Wolf and Gary Kendellen. They heard the case a day earlier. Since losing to pitcher Ben McDonald in 1995, the Orioles have defeated pitcher Arthur Rhodes (1996), outfielder Tony Tarasco (1997), catcher Charles Johnson (1999 and 2000), pitcher Jose Mercedes (2001), pitcher Rodrigo Lopez (2006), pitcher Brad Bergesen (2012) and outfielder Alejandro De Aza (2015). The 30-year-old Joseph hit .174 last year with three doubles in 132 at-bats and 141 plate appearances. The previous highs for a player with no RBIs were set in 1971 by Chicago White Sox All-Star pitcher Wilbur Wood with 96 at-bats and 124 plate appearances, according to the Elias Sports Bureau. Joseph made $523,500 last year and was eligible for arbitration for the first time. Clubs have won two of the three decisions this year, with Boston pitcher Fernando Abad also losing and Oakland outfielder Khris Davis winning. Right-handers Kevin Gausman ($3.55 million vs. $3.15 million) and Brad Brach ($3.05 million vs. $2,525,000) remain scheduled for hearings, which run through Feb. 17. Baltimore said it would be a ”file-and-trial” team, meaning it would not settle after the exchange of figures on Jan. 13.